Gone are the days when any sign of belonging to the Christian Church, including wearing a crucifix, could entail serious implications, in the best case, ridicule. Wearing a cross today, none are forbidden. Another question arises: do I need to do? The main condition for the wearing of the Christian crucifix is the understanding of its meaning. It is neither decoration, nor a talisman, able to protect from all misfortunes. Such an attitude to the sacred subject is characteristic of paganism, not Christianity. The pectoral cross is a tangible expression of "the cross" that God gives a person who wants to serve Him. Wearing a cross, a Christian promises to live the commandments of God, no matter what it takes, and endure all trials. The one who realized it, of course, you need to wear a pectoral cross. The pectoral cross is the sign of belonging to the Church. Those who have not yet joined it, i.e. has not been baptized, to wear a pectoral cross should not. You should not wear a cross on top of the clothing. According to Church tradition, only priests wear crosses on top of the robes. If so does a layman, it looks like a desire to put his faith on display, to boast of it. This manifestation of pride is not befitting a Christian. Crucifix, as its name implies, should be on the body or chest, closer to his heart. You can't carry a cross in my ear in the form of earrings or bracelet. Should not imitate those people who wear the cross in a bag or pocket and say: "He is still with me." This attitude to body cross borders on blasphemy. Put a cross in the bag can only be on time if the chain is torn. It is sometimes said that the four-pointed cross is worn by Catholics, but it is not. 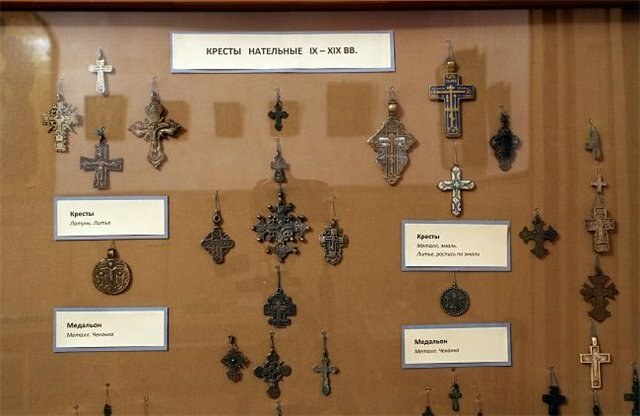 The Orthodox Church recognizes all types of crosses: four-pointed, eight-pointed, with an image of the crucified Saviour. The only thing that should be avoided for an Orthodox Christian is the image of the crucifixion with the utmost realism (sagging body and other details of the sufferings on the cross). It really is typical for Catholicism. The material from which the cross is made, can be anything. It is only necessary to consider the specific person – for example, there are people who have the silver on the body darkens, a man silver cross to anything. No one is forbidden to wear a cross is large or inlaid with precious stones, but you should consider: is it compatible with the Christian faith is the demonstration of luxury? The cross should be consecrated. If he bought in the Church shop, to worry about it not worth it, there is a cross sell is already sanctified. The cross bought at a jewelry store, you need to consecrate in the temple, it will take a few minutes. Sanctify cross once, but if you are not sure of the consecrated or not, it should be done. There is nothing wrong with wearing a cross that belonged to the deceased person. Grandson may receive in baptism the cross of a deceased grandfather, and do not be afraid that he will "inherit" the fate of a relative. The idea of inevitable fate at all incompatible with the Christian faith.